"Please send to all . My name is Bryan Young, I have worked in the hobby business for more than 10 years. I am the new SCX tech support here in the US. if you have any problems please call or email with you problems. Bryan, if you're out there, Welcome to SCI. Hope we don't make pests of ourselves. THANK YOU & SCX for your help and support. From all SCX Digital users and fellow Slotheads here at SCI; WELCOME ABOARD!!! Last edited by mmmoose1; 06-22-2007, 03:47 PM. Just to update this, the above email address is the current one I have for Bryan Young who is the tech support for the US market for SCX. The phone number in the first post is the one to use to talk with Bryan. I've asked to be a moderator in the SCX forum to help SCX stay in touch with their racers and to help answer questions when I can. Whether you're a newbie or a seasoned vet, let's breathe new life into this section of SCI. If you've got a question and I can answer it, I will. If I can't, I'll find out directly from SCX. If you're got a concern or suggestions for SCX, I'll pass them along. Last edited by DaveKennedy; 10-29-2007, 04:06 PM. hey dave am a big scx fan and have been for years just one quick question the scx cars that i have have been great but the xenon lights have just been a p.o.s i have tryed to have them warrantyed by scx but of no vail. would u be the one to help here. if not thas ok but i would be great if scx would step up here. thanks and hope to be hearing from u soon. Vision34, you've contacted Bryan about this? ya but i have not recived a response this was back in june so i just gave up and i have been trying to contact scx in spain. but at no vail. Bryan & SCX Support is fantastic! Don't forget to check out Bryan's tech support videos. Those videos are an excellent marketing product. I agree. I watched them all, really nice work. I assume SCX knows what they have in you. The company would be wise to treat you well. BTW, your "clean a dirty car" video had me cracking up. I watched Brian's YouTube demo about 6 car set up. I bought the NASCAR Tri Oval and a Pit Box. Does anyone know, can I use the control box that came with the Tri Oval set and hook it up with the Pit Box for the additional 3 cars? Do I need to buy the cable, is there something special about it, or can I make up my own CAT 5 cable? 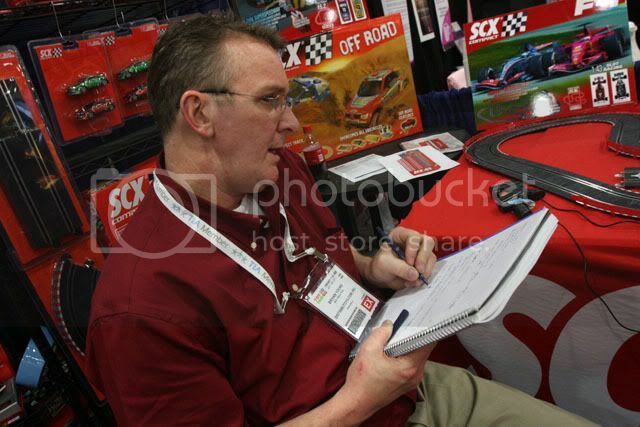 Here's Bryan hard at work in the SCX booth at the NYToyfair answering questions from customers on his cell... he's quite a character! Contacted Bryan a few weeks ago regarding a problem with my SCX Nascars. He replied immediately and shipped out some replacement parts straight away! !